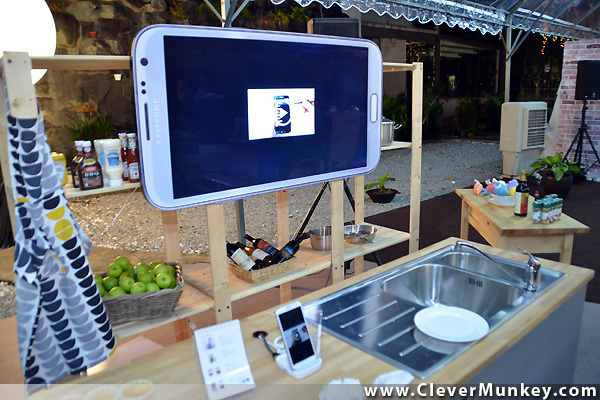 Exactly a week ago (11 October 2012), more than 50 bloggers were invited to the Launch of the Samsung Galaxy Note II at Zebra Square, Kuala Lumpur. If you're wondering where's Zebra Square you're not alone. I never knew the existence of this place until last week. The Samsung Galaxy Note II's theme is 'On the Go Creativity' where it enables personalized unique experiences and expressive content creation. The Galaxy Note that was launched a year ago carved a new category of smart mobile devices, making it a milestone for Samsung. This year's Note II was proudly introduced as a device with the capabilities for people to unleash their creativity at work or leisure. "Built with an unbeatable viewing experience as well as unique and differentiated features, people can discover information and capture their ideas faster, express thoughts freely and manage tasks more efficiently." Ensures an immersive and enriched movie theater-like video viewing experience. Air View allows people to hover with the S Pen over an email, S Note, S Planner, image galleries, or videos to preview the content without having to open the file. Quick access in viewing information on screen without the need of screen transition. Quick Command allows people to take shortcuts with the S Pen. The S Pen enables people to capture ideas and inspirations instantly and easily, even to combine handwriting with any digital content on the screen. 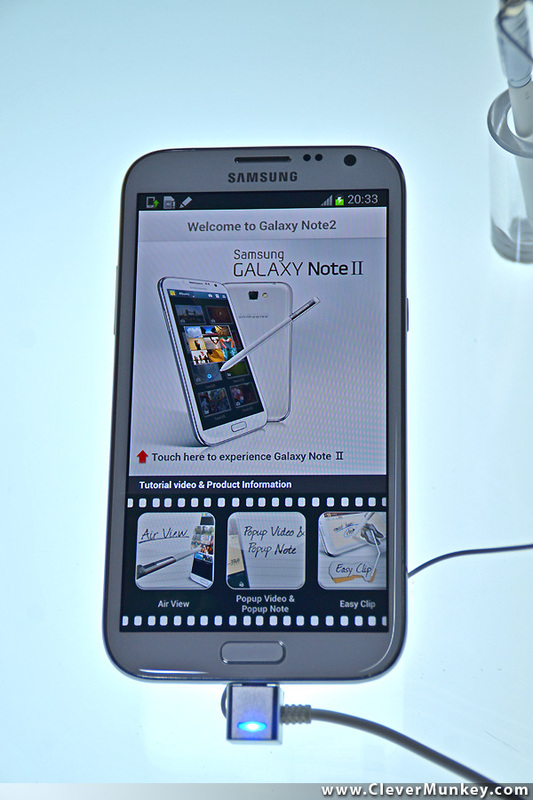 The Samsung Galaxy Note II is able to recognize the content or picture intuitively and to clip, crop or edit a selected content in any shape by the S Pen button; and subsequently save, share or paste it. A sketch by Ernest Zacharevic of Deborah Henry when they were on stage. With the Galaxy Note II content can be personalized easily by colouring shading, or adding notes even with personal handwriting. With the Note II, multitasking is made seamless and intuitive, whether is watching a video, texting, or sketching. All thanks to these three new features: Pop Up Note, Multiwindow, and Pop Up Video. Display shows sketching while video is being played. Pop Up Note - allows the S Note to be opened as a pop-up window anywhere on screen, even when watching a video or taking a call. Videos become a floating window on display with the touch of a button, able to be repositioned to anywhere on the screen. New model means improved performances. The Note II is now build with the latest technology that offers high performances. With the 1.6GHz Quad-Core processor and HSPA Plus, it delivers easy multitasking, lightning fast screen transitions and browsing performance, and app start-ups with minimal lag time. memory options of 16GB with an expandable micro SD memory slot. Battery of 3,100mAh - enjoy multimedia content, productive and always on the go, to capture ideas whenever wherever. Comes with 8 Megapixel rear-facing and 1.9 megapixel front-facing with HD recording. Camera features - Buddy Photo Share, Burst Shot and Best Photo. A unique camera function: Best Face - allows people to choose the most preferred face or pose of each person from group portrait photos. In the picture above, Adam C is taking a picture of Luke Au (Product Manager) and Vincent Chong (Head of Mobile Division). He then cropped both of their heads and switched their heads to each other's body. available for people to share content by connection Galaxy Note II to Samsung HD TVs, phones, mobile tablets, laptops on the same network. The new Samsung GALAXY Note II will be available in Marble White and Titanium Gray. They will be available on 19 of October 2012 through key operators (Celcom, Digi, and Maxis). Device can also be purchased through all Samsung Elite Partners. Format: 3GP (MP4). WMV(ASF), AVI, FLV, MKV, WebM. After the press conference there was a giveaway of two Samsung Galaxy Note II. People went all gaga ready to win it. There's a paper in the balloons, if the paper in the balloon states congratulations then you have wont yourself a Galaxy Note 2! Saw my old Uni friend! He's working for a magazine company now. Calvin. Mine is the top left and it's filled with so much cream, sugar and fats! I enjoy the decorating part but i won't eat it. Haha. Henry Lee, it was his birthday! ooo they have free cupcake! is it tasty? I didn't eat... i filled it with cream and sugar super fattening but i didn't eat it haha.